All told, around 40% of America's 850 banks soon were out of business. Most sectors of the economy slumped. The specie suspensions caused panic, which in turn led to widespread bank failures. The New York diarist George Templeton Strong said, of the banks, "So they go — smash, crash. Where in the name of wonder is to be the end of it?" All told, around 40% of America's 850 banks soon were out of business. Most sectors of the economy slumped. Business failure brought unemployment. By January 1838, half a million Americans were jobless. Wholesale prices tumbled, and the nation's money supply shrank. Imports plummeted, as did property values. America would not again see such deep, prolonged economic malaise until the Great Depression of the 1930s. Predictably, President Van Buren was blamed for the downturn. Whigs insisted that Jackson's reckless policies, carried forward by Van Buren, had wreaked havoc on the economy. What was needed, they argued, was government-sponsored stabilization of the economy through a new national bank. As the "out" party, the Whigs profited politically from the depression, gaining in state elections at moments when it was especially bad. He did not seem to recognize the depth of the nation's crisis. A much later Democratic presidential candidate would heed advice that should have been shouted in Van Buren's ear: "It's the economy, stupid!" Despite the small upturn of the economy in the middle of Van Buren's term, the nation had never seen such hard times as it did under him. It was difficult for many Americans to fathom the withdrawal of the government's money from many banks at a time when money was in such short supply. The Democrats' largest base was among rural and urban workers. The Whigs appealed mainly to business interests in the North and plantation owners in the South, but also to some sectors of the working class. Neither party was wholly "the people's party," though the Democrats had seized this image. The Whigs believed in government control of the economy through some version of the American system. They tended to be affiliated with movements like temperance, prison reform, nativism and anti-prostitution. 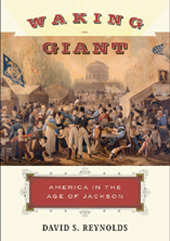 Editor’s Note: This feature is adapted from “Waking Giant: America in the Age of Jackson” by David S. Reynolds. Copyright 2008, David S. Reynolds. Reprinted with permission of the author.